#VolcánDeFuego Se realiza monitoreo en aldea El Rodeo y comunidad La Reina con personal de la Coordinadora Local para la Reducción de Desastres -COLRED- de La Reina, no se registra caida de ceniza. Guatemala’s Fuego volcano erupts – most violent eruption in 4 decades. The eruption, second this year, killed at least 25 people,and left about 300 injured. “Volcano of Fire” ejected a thick column of smoke and ash more than 8-kilometer into the air. Most of the casualties were located in three towns: El Rodeo, Alotenango and San Miguel los Lotes. For the third time in six weeks, the world’s tallest active geyser erupted Friday morning at Yellowstone National Park. Recent eruptions at the geyser occurred March 15 and April 19. Seismic data indicates Friday’s eruption may have been around the same size as the one on April 19 but larger than the March incident. Steamboat is located in a part of the park that’s snowed in much of the year. Roads into the area remain closed due to deep snow and ice on the boardwalks. Steamboat can eject steam up to heights of 130 meters. Old Faithful, which erupts about a dozen times daily, averages 40 meters in height. Mt Ioyama on Kyushu island in southwestern Japan erupted Thursday (3.39PM), spewing volcanic rocks around the crater. Japanese officials have raised the volcanic alert level to 3 (scale of 1 to 5), warning people to stay away from the mountain because of the danger of falling rocks and pyroclastic flows within a 2-km radius of the crater, NHK said. At least one person was killed according to local reports. Snow-covered Mt Kusatsu-Shirane erupted Tuesday morning (9:59am local time). The 2,160-meter high volcano spewed plumes of ash and staem, ejecting rocks and volcanic matter, triggering an avalanche and injuring at least two dozen, the local weather agency said. Authorities warned of potential falling rocks within a 2-km radius of the triple-crater raising the volcanic warning level from 1 to 3 (scale of 5), which bans visitors from entering the mountain area. The Kusatsu-Shirane is located in the town of Kusatsu, Gunma Prefecture. FIRE-EARTH Volcano Alerts available via FIRE-EARTH Pulsars. The danger zone has been extended from a 6-km radius to 8 from the summit as pyroclastic flows may reach more areas, staff said. PHIVOLCS: MAYON VOLCANO BULLETIN 23 January 2018 8:00 A.M.
At 12:43 PM yesterday, a dense, five-kilometer tall eruption column was generated by a short-lived phreatomagmatic eruption at Mayon Volcano that lasted eight (8) minutes based on the seismic record. The event generated pyroclastic density currents or PDCs on gullies and barrancos heading the Miisi, Bonga, Buyuan, Basud, San Andres, Buang, Anoling and other minor rivers within four (4) kilometers of the summit vent, well within the Permanent Danger Zone (PDZ). Volcanic ash was blown west and fell on the Municipalities of Guinobatan, Camalig, Oas, Polangui and Iriga City. This was followed by a minor degassing event at 5:51 PM that generated a short, 500 meter-high ash plume. 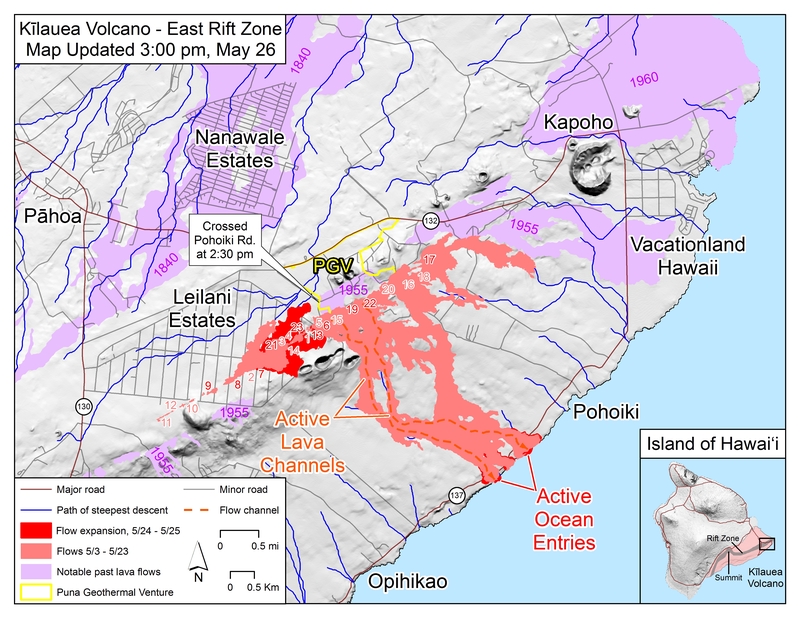 Between 9:37 PM and 5:25 AM the following morning, five (5) episodes of intense but sporadic lava fountaining from the summit crater lasting three (3) to thirty (30) minutes occurred. The lava fountains reached 500 meters to 700 meters high and generated ash plumes that reached 2.5 kilometers to 3 kilometers above the crater. The events fed lava flows on the Miisi and Bonga Gullies, sprayed near-vent lava spatter and fed incandescent rockfall on the summit area. A total of two (2) explosion-type earthquakes corresponding to the vertical column eruptions, fifteen (18) tremor events, some corresponding to lava fountaining episodes, thirty five (35) rockfall events and (2) pyroclastic density currents or PDCs from lava collapse were recorded by Mayon’s seismic monitoring network. Rockfall events were generated by the collapsing lava front and margins of the advancing lava flow on the Miisi Gully and by shedding from the summit dome onto the Bonga Gully. Currently, the Miisi and Buyuan lava flows have advanced to three (3) kilometers and 200 meters, respectively, from the summit crater. Sulfur dioxide gas emission was measured at an average of 992 tonnes/day on 22 January 2018 prior to the phreatomagmatic event. Electronic tilt and continuous GPS measurements indicate a sustained swelling or inflation of the edifice since November and October 2017, consistent with pressurization by magmatic intrusion. PHIVOLCS has raised the alert level to Alert Level 4 yesterday in effect over Mayon Volcano. The public is strongly advised to be vigilant and desist from entering the eight (8) kilometer-radius danger zone, and to be additionally vigilant against pyroclastic density currents, lahars and sediment-laden streamflows along channels draining the edifice. Civil aviation authorities must also advise pilots to avoid flying close to the volcano’s summit as ash from any sudden eruption can be hazardous to aircraft. DOST-PHIVOLCS maintains close monitoring of Mayon Volcano and any new development will be communicated to all concerned stakeholders. Evacuation zone around Bali’s Mt Agung has been widened to 10km amid imminent threat of a major eruption. A column of black smoke, gasses and ash is soaring to a height of at least 3.4 km above the crater. Lava is visible in the crater. A magmatic eruption could occur anytime. Mount Agung ejected a thick plume of smoke more than 1,500m above the crater, the second major eruption from the Bali volcano this week, disrupting flights. Indonesia’s Disaster Mitigation Agency said in a statement. A 7.5km exclusion zone around the volcano has been effected and residents ordered to immediately evacuate the danger area. Researchers have discovered a huge upwelling of hot rock under Marie Byrd Land, which lies between the Ross Ice Shelf and the Ross Sea, is creating vast lakes and rivers under the ice sheet. The presence of a huge mantle plume could explain why the region is so unstable today, and why it collapsed so quickly at the end of the last Ice Age, 11,000 years ago. After a month of heightened activity, Nevados de Chillán volcano erupted, spewing a giant plume of ash reaching up to 3,600 meters into the air. Nevados de Chillán, located in the Andes, Bío Bío Region, Chile, and is one of the most active volcanoes in the region. “The eruption generated a very large column of smoke that rose more than 10km (six miles) into the air, and later drifted toward the south-west part of the volcano,” said the Ecuador’s Geophysics Institute. The volcano, located on Isabela Island, erupted for the first time in 33 years. “From 02:57 (local time Galapagos) Warning Center Volcanic Ash (VAAC), based on satellite information confirms the presence of an eruption column from Wolf Volcano, which rises to 35,000 feet and heads south-west; then at 04:34 it is reported of a column moving east-northeast at an altitude of 50,000 feet and another moving southward at a height of 45,000 feet (Fig. 2),” said Ecuador’s Geophysics Institute.